U.S. Civil War Draft Registrations, 1863-1865, Perry, Marion County, IN: "William S.Thomas, age on 1 Jul 1863: 23, single." There are two entries for Civil War service of a "William S. Thomas," but they do not refer to the same individual. 1. William S. Thomas, Co. B, 8th Indiana Inf, Pvt in and Pvt out. Pension application No. 380181 & certificate No. 334903 10 Sep 1888: "Widow Lydia N. Thomas." 2. William S. Thomas, Co. E, 55th Indiana Inf, Cpl in and Cpl out; Co. K, 139th Indiana Inf. Pension application No. 1208577, certificate No. 985,439: "19 Jul 1898; no widow." Certificate NO. 985,439, Declaration for Pension, 3 Feb 1917: William S. Thomas . . . born November 18, 1841 at Hancock County, Ohio; [died 6 May 1922 Kimmell, Noble County, IN; buried Wolflake Cemetery]. His several places of residence since leaving the service were Allen County (1864-1871; 1889-1896), [Wolf Lake IN, near Gary IN, in] Noble County IN (1871-1889; 1896-present)." Find-A-Grave contains an image of his gravestone. Therefore, this particular "William S. Thomas" is definitely not "I462281 William S. Thomas" and is not related to Edward C. Thomas and Catherine Moore. Edited by Roy Richard Thomas, December 2007. 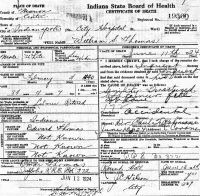 Born - 4 Feb 1841 - Perry, Marion County, Indiana, U.S.A.
Died - 11 Jun 1924 - Indianapolis, Marion County, Indiana, U.S.A.
"William Thomas age 40 b. Abt. 1840 Indiana, father b. Kentucky mother b. Ireland, farmer, wife Lydia, age 37 b. Abt. 1843 Indiana, father b. Tennessee mother b. Indiana. Servant: Lincoln Lucas, age 20 b. Abt. 1860 Indiana, white, single, farm laborer." "William S. Thomas age 60 b. Feb 1841 Kentucky, father b. Tennessee mother b. Ireland, farm labor, wife Lidia M., age 58 b. Apr 1842 Indiana, father b. Tennessee mother b. Pennsylvania; two nephews, both born Indiana, parents of both born Indiana: Isaac Haverstick age 17 b. Oct 1882, John Haverstick age 15 b. Apr 1885." One nephew was Isaac Sylvester Haverstick, WW I draft: "b. 12 Oct 1882, machine work, Link Belt Co., Indianapolis, Marion County, IN, wife Lillie M."
Indianapolis Star, 9 Oct 1909, p. 9: "Realty Transfers: Pivot City Realty Co. to William S. Thomas, lot 48, Talbott's revised addition, 40 x 120 feet, west side Pennsylvania St, north of 19th St."
"William Thomas age 70 b. Abt. 1840 Indiana, both parents b. U.S.A. [sic], boarder farm labor." "William S. Thomas, Head of houshold, age 79 b. Abt. 1841 Indiana, father b. Kentucky mother b. Ireland speaks Irish [sic], farm laborer, widower."